Frequent in woods. Occasional in calcareous fens and prairies. Sometimes abundant in oak woodlands that are burned regularly. In woods with Acer saccharum, Fraxinus americana, Ostrya virginiana, Parthenocissus quinquefolia, Prunus serotina, Prunus virginiana, Quercus alba, Quercus rubra, Ribes missouriense, Vitis riparia. Also with Carex pensylvanica, Claytonia virginica, Cryptotaenia canadensis, Erythronium albidum, Galium aparine, Geranium maculatum, Geum canadense, Hydrophyllum virginianum, Osmorhiza claytonii, Phlox divaricata, Podophyllum peltatum, Polygonatum canaliculatum, Sanicula gregaria, Smilacina racemosa. NY west to MN, south to VA, AL, and OK. Less common east of the mountains. Herbaceous perennial. Leaves alternate, pinnate compound; the leaflets ovate to lanceolate, acuminate, to 1.5" long, opposite to alternate on the rachis. Flowers blue-purple, to 1" wide, in sparse clusters on a long peduncle; corolla lobes 5; stamens 5, tipped white. The name "Jacob's ladder" is a biblical reference, although the "ladder" in Jacob's dream was more likely a staircase, mistranslated in the King James version of the text. 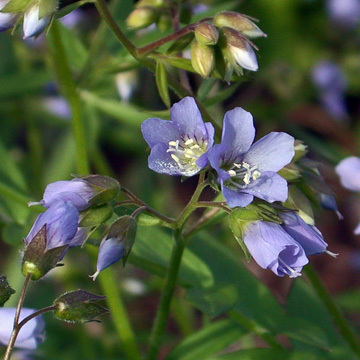 This name also might be more appropriately applied to the cultivated plant Polemonium caeruleum.